A movie based on the memories in between the milestones is an incredible thing to watch. This plus the story being filmed over twelve years of actual people's lives makes it even more unbelievable. 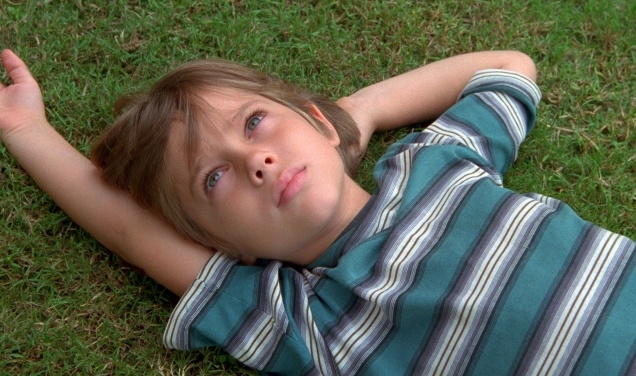 Boyhood is a two hour and forty-five minute excursion into the family of a single mother and her two children. It focuses mostly on Mason, the main character, and his childhood to teenagehood to early adulthood- his boyhood. I'm definitely late to the game on this one but I loved it all the same. It's something that's never been done before, and there's a reason for it, but that doesn't mean it was a bad idea. For the nearly three hours I spent watching this movie, I was immersed into Mason's world. My eyes were sore afterwards from not being able to look away from the life unfolding on screen. The way the story was paced made it feel like a novel. Picking out little moments, contributing to the larger story. But in the same way it didn't feel like a novel at all, it seemed like the actors were making it all up on the spot. Things would happen and never get referenced again, and some things would happen and have a large impact later on in the movie. They grew up and moved houses then moved again for work and school and lived a completely real life. My favorite relationship was between Mason and his older sister, Samantha. In early scenes, they'd bicker and fight just like real siblings. There was a scene of them in their car, hitting each other with their mother yelling at them from the driver's seat. This moment felt picked right out of my own childhood, or anyone's childhood with a sibling. I didn't know much about this movie going into it other than the song Hero was at the end, which leads me to- the soundtrack is amazing. It's mostly composed of early 2000s alternative-rock. Opening up on Yellow by Coldplay, then Arcade Fire, and Vampire Weekend and The Flaming Lips, list goes on. The movie itself felt like it could be two separate films. One about a tangled childhood in a web of new homes and one a coming of age story. This contributed to the difficulty of looking away from the screen in fear of missing something important to either story. Each flowed into the other seamlessly, leading you to believe it was really what Ellar Coltrane's, who played Mason, life was like for all those years.